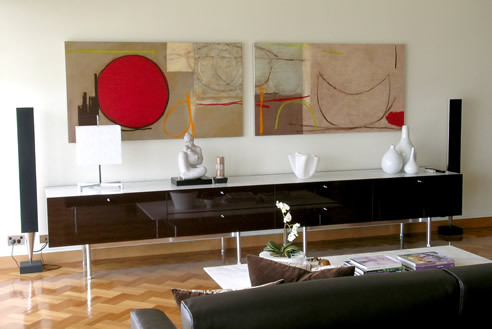 Original Artwork adds colour to your home and inspiration to your life! A great example of how introducing a bold colour into a space can really add something while complementing its surroundings and not overpowering any of the all ready present attributes. These commissioned acrylic on canvas painting's by artist CB really brings the room to life and works great with the surrounding decor. Note how each colour promotes and supports all other colours present.